Memory, Memory...Where Art Thou, Memory? Hey guys! How fun is the "Memory" game??? My clients happen to LOVE playing, and I started using homemade cards to teach the alphabet with it! This one is SUPER simple and fun! I printed out two copies of the letters (above) and pasted them on index cards. 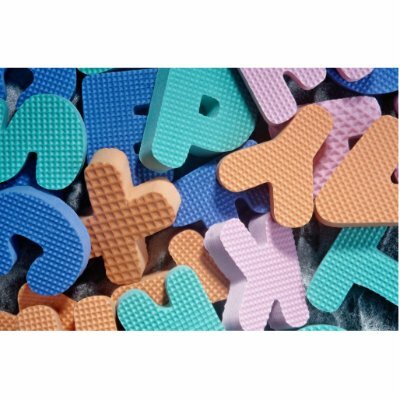 I then took the foam letters (right) and used them as manipulatives to represent the letter we were searching for. My client learning the alphabet had to touch the letter and see how it feels/the shape/etc., then we named it together, and then we matched it to the cards. I used this for my artic client as well! Using the same premise, I printed out her target sound (3-5 copies) and a few other sounds we're fine-tuning. Using the same manipulatives she placed them on the upside down card she thought would match it. If she was right, she said her sound 1x and added the letter to her "sound pile". We got in a lot of trials, and had fun! Try this simple game out!